Brimful Curiosities: LeapFrog Tag for the Library! Remember all those LeapFrog Tag contests in celebration of National Education Association's National Reading Month? We won a prize package! 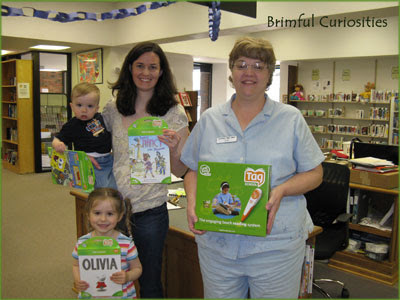 We donated the whole prize - the two Tag readers and the Tag books (minus two for ourselves) - to our public library! Thanks LeapFrog for a wonderful promotion. What a great use for your winnings. Hopefully lots of kids will be able to enjoy them. Congrats. on winning. That was so nice of you to donate them to your library. That's really wonderful! I'm sure a lot of kids will enjoy them! How nice! I'm sure they will be enjoyed by many kids. That's so cool! I really wanted to win that! Congrats! How do your kids like it?